There are plenty of day trips from Dubrovnik for you to choose from - such as trips to nearby Elaphite islands with beautiful sandy beaches and fisherman villages, Peljesac peninsula where you can visit local wineries, Konavle region where you can experience traditional way of life. A great ideal would be a visit to the island of Mljet with its national park and the island of Korcula - the birthplace of Marco Polo. While in Dubrovnik you can take opportunity to visit neighbouring countries - Montenegro and Bosnia and Herzegovina. 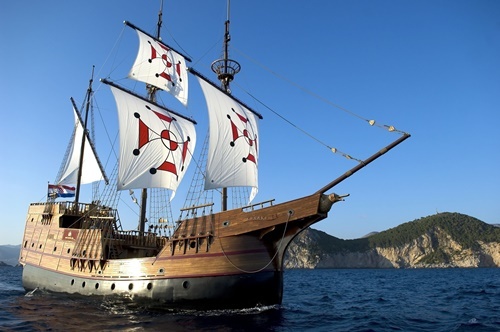 Explore the Elaphite island on a day trip with "Karaka"
One of the most popular destination for escape from Dubrovnik's tourist crowds are the Elaphites, sunny islands situated northwestern of Dubrovnik. These picturesque islands (Kolocep, Lopud and Sipan) are ideal spot for sunbathing and swimming during hot summer days. You can take a regular boat to go there or maybe book an organized boat tour which hop from one island to another leaving you free time to explore each of them. For those seeking to experience the islands in unique way there is a sea-kayaking tour on which you will paddle along the rocky coast and sandy beaches. For those wishing true comfort a private sailing tour is ideal for relaxing and soaking up the Croatian sun onboard sailing boat. A visit to the peninsula of Peljesac is ideal for local food and wine tasting along with relaxing on the beach. This area is famous for vineyards and wine production. The area of Ston is famous for salt production and oysters farming. Peljesac is the area of small fisherman villages, hidden beaches and vineyards. At any time you can pop over to one of private wineries where you can taste local wines (Postup, Dingac, Plavac Mali) and find out secrets of wine production from the owners. Several great restaurants with delicious sea-food can be found in the town of Mali Ston. If you are interested in sunbathing and swimming, head to Prapratno where beautiful sandy beach is situated. Visit to this area is not complete without visiting the nearby island of Korcula where you can visit "Marco Polo" museum. Not far from Korcula there is a true gem among Adriatic's islands - the island of Mljet. This island is an ideal spot for those looking for untouched nature since the majority of the island is covered with thick pine forest, and western part of the island is a National Park. The best way to explore Mljet is to hire a bike and enjoy Mediterranean scenery and crystal blue sea. To experience traditional way of life you should visit Konavle region, south of Dubrovnik. Here you can visit village of Ljuta with its mill, numerous vineyards and olive groves, Sokol kula - viewpoint from where you can enjoy amazing views of the region. In Konavle you can get to know the tradition of silk production and buy beautiful Konavle embroidery. For those who are active choose hiking or cycling through untouched nature of this area or visit adventure park - Cadmos Village. Konavle region with the picturesque town of Cavtat is situated south of Dubrovnik. This region is ideal for those wishing to get to know Croatian tradition, taste delicious local delicacies and enjoy untouched nature. In the area you will find local household which produce wines, fruits & vegetables. Konavle was in the past famous for silk production. Now this tradition is alive only for tourist purpose. Konavle region offers various options for outdoor people. Here you can experience hiking and see mount of Snjeznica, vineyards and other farmlands, small rivers, pine trees and breathtaking Konavle rocks. Cadmos Village is an adventure park situated in Konavle near village of Komaji hidden in unique oak woods. This is ideal place for families with children where you can escape from Dubrovnik's crowds. Take a biking tour to konavle and cycle through vineyards and olive groves, visit the village of Ljuta, see the old watermill and the Franciscan Monastery. Despite the fact that magical Plitvice Lakes are pretty far from Dubrovnik, a day trip there might be one of the best experiences. For those who would like to visit a place across the border there are two options: Montenegro and Bosnia and Herzegovina. While you are on holiday to Dubrovnik you may wish to visit neighbouring countries Montenegro and Bosnia and Herzegovina. For some of the most dramatically scenery on the Adriatic coast, head to the walled town of Kotor. The drive from Dubrovnik afford amazing views of the bay. Herceg Novi is also worth a stop, especially if you'd like to take a swim as there are a number of pebble beaches and concrete swimming terraces. Another destination would be Budva. To visit Montenegro from Dubrovnik the most convenient but definitely pricier is to take an organized excursions.